The car industry is set up to reserve its best features for its top-level cars, mostly because they want you to pay more for better options (and because those options are more expensive). Here are the features Jalopnik readers think should filter down to more mainstream models. Of course, by definition there is a limitation of what features can go into a bargain basement car. Cutting-edge technology is expensive, and if you add more of it to a cheap car, that car stops being cheap. There are a few things going for us with these technologies: economies of scale would bring prices down. Carmakers could be willing to take a hit in profitability per car if a new feature will slingshot them ahead in sales (take the Prius, for example). The price of many of these features is artificially inflated for luxury cars with high profit margins. They always get you with the options, and there's room for prices to come down. That said, what other features (tech or otherwise) do you wish were on your current car that you could only buy on an exotic? Let us know in Kinja below. There's not much need for gauges anymore now that we can beam important information right onto the windshield. You can get an HUD in a Corvette and some other cars, but distracted drivers in Camrys and Elantras need them, too. Turbochargers with adjustable turbine vanes have been common in diesels for years now, but only in high-spec exotics do we see them in gasoline engines. They're more efficient and provide a wider band of power for the engine. 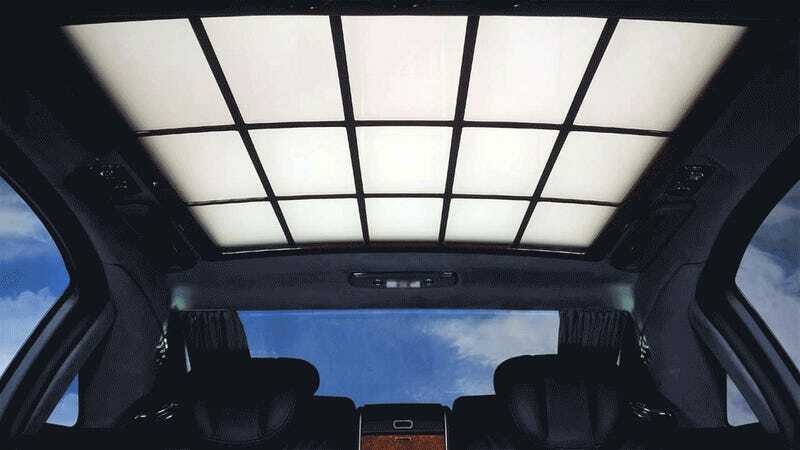 Wouldn't it be nice to have a set of tinted windows on a searing hot summer day, and then a clear set that night? You can get electronically-adjusting tints on top-flight luxobarges like the Maybach, but why keep them from us plebes? Not everyone wants a car that's Lexus-quiet. We should be able to buy a rich-sounding car without being forced into the high-dollar ranges of sports cars and sports sedans. Car enthusiasm is not exclusive to the rich. The computer brains in cars these days monitor just about every aspect of the vehicle's performance and operation, with codes for every kind of malfunction. Why aren't we allowed to see this information? We want gauges that tell us what's going on with our engine, not just blinking lights to hint that something — anything — could be wrong. Ban the 'check engine' light. Just let us read error codes. You can get this feature on Mercedes S-Classes, but the majority of us who have to drive through deer-filled forests and dark urban streets have to squint into the night on our headlights alone. There are two problems with modern affordable car interiors. First of all, they're ugly. Second of all, they're overloaded with buttons and screens. We don't need to be overloaded with price-raising leather, but we would like some of the lightness, clarity, and simplicity you get in supercars. Today, carbon fiber is just too expensive for mass production. In the coming years, however, we can expect the lightweight, strong material to filter down from Paganis and McLarens to BMWs. We want that sped up. Give us an ultralight, safety-celled Civic-class car to save us on gas and boost performance. Back in the innovation-heavy 1950s and '60s, you used to be able to get adjustable suspension on a family car. They were called Citroens. Now we have similar technology available for mass production in the form of magnetic dampers, sold in everything from Cadillacs to Ferraris. Everything from lowering suspension for better highway aerodynamics, to setting the suspension to super-soft over rough ground, to going full banzai sports mode in a base hatchback should be available at the push of a button. Pneumatically-driven valve actuators offer massive gains in power, fuel efficiency, and flexibility in engine management. If every car had this technology, we'd drive faster cars that drank less gas, and the world would be a better place. This tech is only just filtering onto the road with Koenigsegg running around a single prototype, but it's only a matter of time before your next Hyundai has it. We can't wait.